Uveitis is inflammation of the uvea. We mainly describe three kinds of uveitis posterior, intermediate and anterior. Anterior uveitis is the term for inflammation which affects the eye's front (anterior) part of the uveal tract. 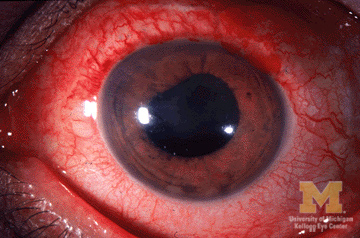 This can include the iris (iritis) or the iris and the ciliary body (iridocyclitis). It is the most common type of uveitis and the most painful. It is most often caused by inflammatory diseases, infections or trauma. Intermediate uveitis is the term for inflammation which affects the middle part of the uveal tract or eye, mainly the vitreous humour. It can also affect the underlying retina. It has been linked to several diseases, including sarcoidosis. Posterior uveitis is the term for inflammation which affects the back (posterior) part of the eye. It can affect the choroid, the head of the optic nerve, and the retina (or any combination of these structures). It includes chorioretinitis, retinitis and neuroretinitis. Posterior uveitis is the least common form of uveitis. Panuveitis is the term for inflammation affecting the whole of the uveal tract. This is the most serious form. Behçet's disease is one of the most common causes and it can severely damage the retina. Uveitis reached the uvea of the eye including the choroid, ciliary body and the iris. Intermediate, posterior and panuveitis are the most likely forms of uveitis to affect vision, and the most recurrent forms. It is thought that between 17 and 52 per 100,000 people develop uveitis each year in the UK. It mostly affects people between the ages of 20 and 59 and is uncommon in children. However, uveitis can affect anyone of any age. If you have one of the underlying conditions or problems mentioned above, you are at greater risk of developing uveitis. In countries of the developed world, such as the UK, uveitis is the cause of visual impairment in about 1 in 10 people. An attack from the body's own immune system (autoimmunity). However, in up to half of cases, no specific cause is found. This is known as idiopathic uveitis. With proper treatment, uveitis usually heals well and without sequelae. However, recurrences are common, and cataracts, glaucoma, macular oedema, vascular obstructions, or a retinal detachment may occur, which may well impair vision. Uveitis is usually suspected on the basis of the symptoms that you have. If your doctor suspects that you have uveitis, you will usually be referred to an eye specialist for further examination and confirmation. The doctor may start by testing your vision. This allows them to assess any differences in vision between your eyes. It also means that they can tell if the uveitis is causing your vision to worsen. The doctor examining your eye will use a special microscope called a slit-lamp to examine your eye. If you have uveitis, the doctor will see some specific signs of inflammation in your eye that will allow them to make the diagnosis. You may need further investigations, especially if the doctor thinks there may be an underlying problem. You may also need further investigations if you have had previous episodes of uveitis, or if this episode is severe or affects both eyes. These tests may include optical coherence tomography (OCT), which takes special pictures of your eye, blood tests and possibly also a chest X-ray. If your eye doctor determines you have uveitis, he or she will likely prescribe a steroid to reduce the inflammation in your eye. Whether the steroid is administered as an eye drop, pill or injection depends on the type of uveitis you have. Because iritis affects the front of the eye, it's usually treated with eye drops. Posterior uveitis usually requires tablets or injections. Depending on your symptoms, any of these treatments might be used for intermediate uveitis. Steroids and other immunosuppressants can produce many serious side effects, such as kidney damage, high blood sugar, high blood pressure, osteoporosis and glaucoma. This is especially true of steroids in pill form because the dose must be relatively high in order for enough of the drug to find its way to the back of the eye. So it is important to follow your doctor's dosage instructions carefully and to keep visiting him or her regularly to monitor the progress of the treatment. Retisert (Bausch+Lomb) is the first surgical implant to gain FDA approval for use in the treatment of chronic, non-infectious posterior uveitis in the United States. Approved in 2005, Retisert is a tiny drug reservoir that is implanted in the back of the eye and delivers sustained amounts of an anti-inflammatory corticosteroid medication called fluocinolone acetonide to the uvea for about 30 months. During FDA clinical trials, the recurrence of uveitis fell from 40-54 percent to 7-14 percent following Retisert implantation. The most common side effects noted during those studies were cataract progression, increased intraocular pressure, procedural complications and eye pain. In a later study, researchers found that surgical implantation of the Retisert device was equally effective as systemic corticosteroid medications for the treatment of non-infectious intermediate, posterior and diffuse uveitis over a period of 24 months. Ozurdex (Allergan) is another long-acting corticosteroid drug implant approved for the treatment of non-infectious uveitis affecting the back segment of the eye. Ozurdex implants contain the steroid medication dexamethasone and are biodegradable. In addition to uveitis treatment, Ozurdex implants also are FDA-approved for the treatment of macular edema following retinal vein occlusion and for treatment for diabetic macular edema in adult patients who are pseudophakic or who are scheduled for cataract surgery. If you have anterior uveitis, your doctor likely will prescribe, in addition to steroids, pupil-dilating eye drops to reduce pain. You also may need eye drops to lower your intraocular pressure if you develop high eye pressure due to uveitis. If you have a known systemic condition that may be contributing your uveitis, your doctor will treat that as well.